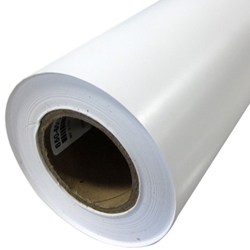 Bosolo - General Formulatioins - Paint Mask 60"
Home → Paper & Tapes → Roll Goods → Masking Film → General Formulatioins - Paint Mask 60"
This product is a 3.4 mil flexible matte white or yellow calendared vinyl film coated with a removable acrylic pressure sensitive adhesive on a 78# liner. The vinyl is formulated for ease of cutting while retaining resistance to common solvents encountered in typical spray paints and automotive finishes. In combination with the removable acrylic adhesive this product has the tack to withstand edge lifting in normal painting processes while removing cleanly after the paint has dried., The 78# bleached Kraft liner provides and excellent base for plotter cut graphics. This product is specifically formulated for easy clean removal from substrates common to spray painting such as metal, glass and acrylic. Sign plotters and cutters can be used to create graphics with this product. Paint Mask films are also used to mask off the first color coat when painting a second or third color. These base colors must be thoroughly dried and cured before the Paint mask film is applied. All paints vary to some degree and this product must be tested in the specific process before production..